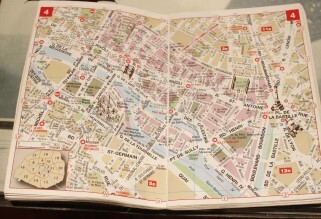 If you don’t have access to data, your phone battery runs flat or simply prefer using a paper map, this handy pocket sized map book and essential tool should be one of the first items you buy when arriving in Paris. Standing on street corners, folding and unfolding maps as they flap in the breeze and desperately trying to locate a street is frustrating and a waste of your valuable time. Most maps don’t list street names and if they do, they only list the main thoroughfares. 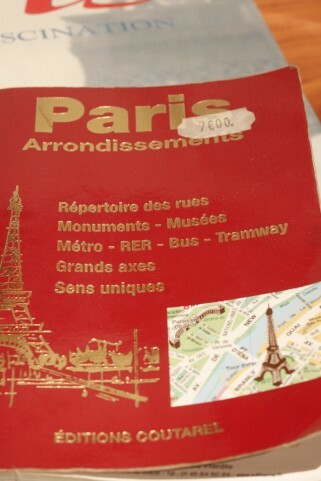 The Paris Arrondissements booklet is a pocket sized book, displaying each arrondissement to an opening, with a full list of every street in Paris, in the same way a conventional street directory works. The booklet also contains a listing of metro stations and bus routes. As well as, a listing of the main monuments with a brief overview, street addresses, the nearest metro station and map references, in French, English, Italian, German and Spanish. Below I will explain step by step, how to use this little gem of book, so you will find your way around Paris with ease and look like a local. Paris is divided into 20 arrondissements, which are municipal districts. Each arrondissement has it’s own town hall or Hotel de Ville. The 20 arrondissements are organised in a clockwise, spiral. Starting with the first arrondissement, in the centre of Paris and spiralling out to the 20th arrondissement. 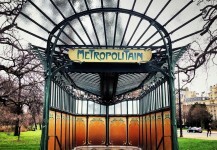 The 20 arrondissements are contained within Boulevard Périphérique, the periphery road surrounding Paris. Each street sign, displays it’s arrondissement at the top of the sign. Here you can see, this street is in the 4th arrondissement. Each postcode in Paris starts with 750 – being Paris, and the last two digits display the arrondissement. Therefore, the 4th arrondissement’s postcode, looks like this 75004. 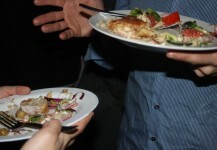 This is very useful to know, when you are using addresses in guide books or have a restaurant address. You automatically know, which page to turn to in the Paris Arrondissement book. If you are lost, for example, go to the nearest street corner, note the street name and arrondissement number and look up the name of the street in the index. When searching for the street name, ensure you have the correct arrondissement also, or you may find the correct street name but in the incorrect area. When searching the index of street names, drop the street type, for example Rue, Avenue, Place, Boulevard, Passage. 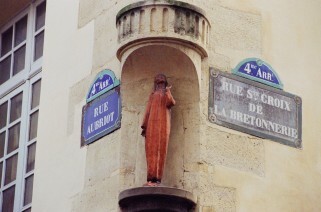 To find rue Saint-Croix de la Bretonnerie, drop the ‘rue’ and look up Saint-Croix de la Bretonnerie. Once you find the street name, following in brackets is the street type (pas) = passage (Av) = Avenue and so on. There are a couple of other letters you will drop when searching the index for a street also. For example des, d’, Place de, de la. Go to map 17, which is the map for the 17th arrondissement and look up grid S 2 and you will find your street. When searching for a street in the index, ensure you have the perfect match. 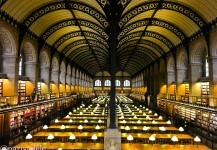 At this point ensure whether it is Boulevard du Temple or Rue du Temple you are searching for. It won’t take you long to get the hang of it. Take your time, get the perfect match and away you go! As I mentioned earlier, the 20 arrondissements are laid out in an outward sprial. Therefore the neighbouring arrondissement, is not necessarily the consecutive number. If you were in the 4th arrondissement and wanted to move east wards, you would be moving into the 12th arrondissement on the right bank and not the 5th arrondissement on the left bank. If the street runs off the map, all you need to do is look at the bottom left of the page. Here you will find a small map, displaying all the arrondissements, with the neighbouring arrondissement. Turn to the corresponding arrondissement page, locate where the street continues on, into the neighbouring arrondissement. (Click on the image to enlarge). 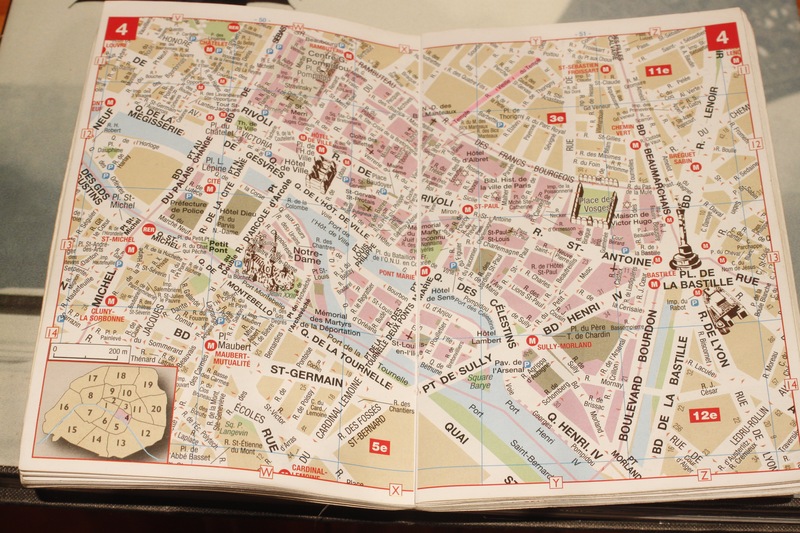 The Paris Arrondissement book is easy to use, once you know how and it’s far more efficient than a tourist map. Although I rely on a map application, I always have this in my bag for when the trusty phone’s battery goes flat and then isn’t so trusty when you are lost. It is well worth the investment. Happy travels! You can find the book in the many news stands dotted around Paris, that sell magazines, newspapers, postcards and the all essential Paris Arrondissements. Also available in bookstores and some Tabacs. If you have found this information useful, please thank me by leaving a comment or following me on facebook for daily photos, updates and anecdotes. Merci and Happy Travels. 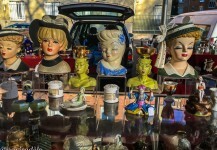 A friendly, vibrant place to spend a weekend morning where you will find a treasure trove of antiques and retro items.